Please click DRAFT 2018-19 Program for a copy of the program in PDF. The Learn-to-Sail classes are run by very experienced volunteers who have vast experience with sailing and yachts. Many of them have their own yachts and sail in local races. All volunteers have Working With Children NSW Accreditation. The fees for classes at Callala Junior Sailing School are very low because of the use of volunteers for all training. Sponsorship is also very important for supporting the club and its fleets of training vessels. 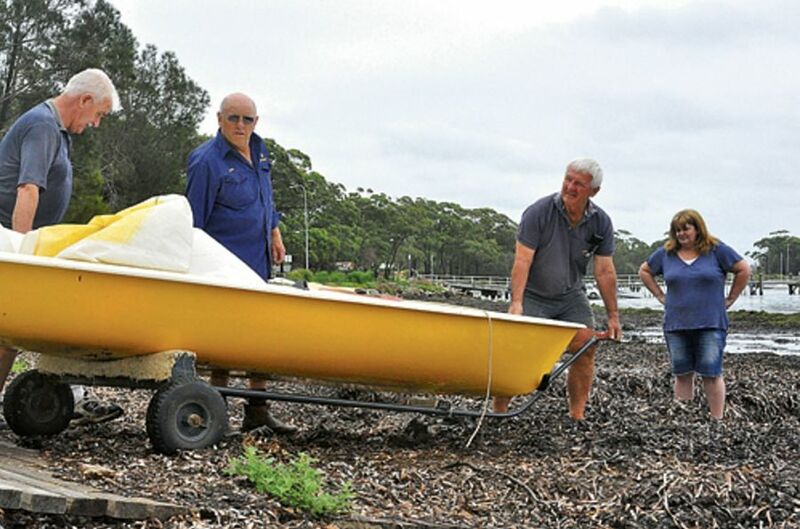 Callala Bay Junior Sailing Club volunteers Michael Kielly, Ron Clapham, Michael Chlopicki and Jennifer Lay battling with weed in 2010. Source: DANIEL PIOTROWSKI; South Coast Register. The learn-to-sail program runs from Spring to summer with a break over the Christmas school holidays. There are groups for novices and more experienced students. The school program is run in Spring and Summer, currently with 20 primary students from Callala Public School during each session.